In a move that's as bewildering as it is novel, Peugeot has unveiled a new dealership. And it's inside a red telephone box. Once a common site across the country, the classic red phone box is somewhat defunct in the modern world. But many have been given a second life, increasingly being transformed into libraries, defibrillator units and even miniature pubs. Measuring a meagre 0.8 square metres, it's claimed to be the world’s smallest dealership. It might not be as exciting as the Tardis, but it looks just as out of place in a bustling, urban landscape as a police phonebox from the 1960s would. Customers can gain access to the diminutive dealership by getting a special code here. 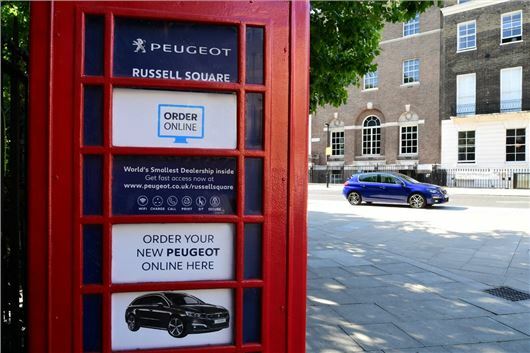 Called Peugeot Russell Square, the tiny dealership will open on 12 September 2017 and potential customers can browse a miniature forecourt in the form of 1:64 scale model cars. The phonebox dealership was launched to celebrate the freedom and flexibility consumers now have when buying a new car. It will be open between 7am and midnight every day until the end of September.